The Gansbaai area offers a huge amount to do, whether you are looking for fun, adventure, nature or leisure. Here are a few of our favourite things to do when in the area. You might be in our region to see Great White Sharks, but our coastline also supports a diversity of smaller sharks. They might not be quite as formidable as their apex relatives, but they are just as beautiful and intriguing. Commonly occurring species include Leopard Cat Sharks, Pyjama Sharks and both Puffadder and Dark Shy Sharks. Most of these smaller species are data deficient, meaning there is not enough research to classify them according to IUCN standards. 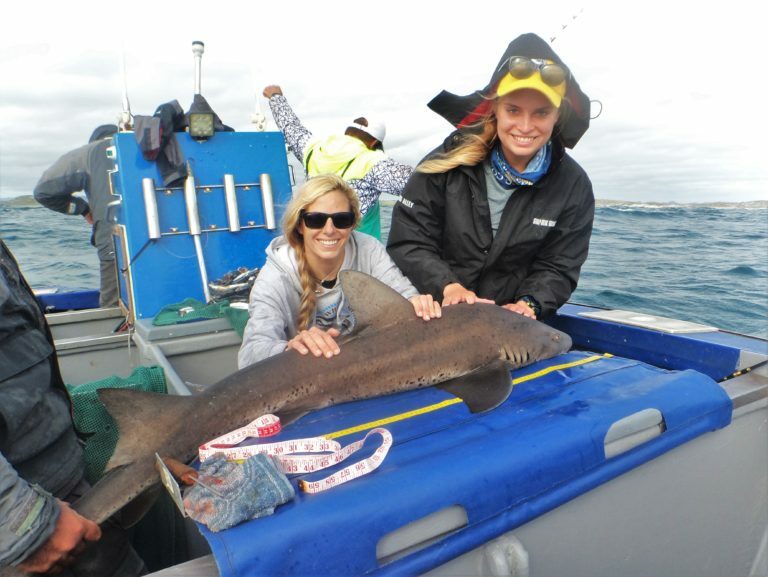 Our affiliate Shark and Marine Institute runs catch-and-release tagging trips on our research vessel that will allow you to experience these special creatures first hand! 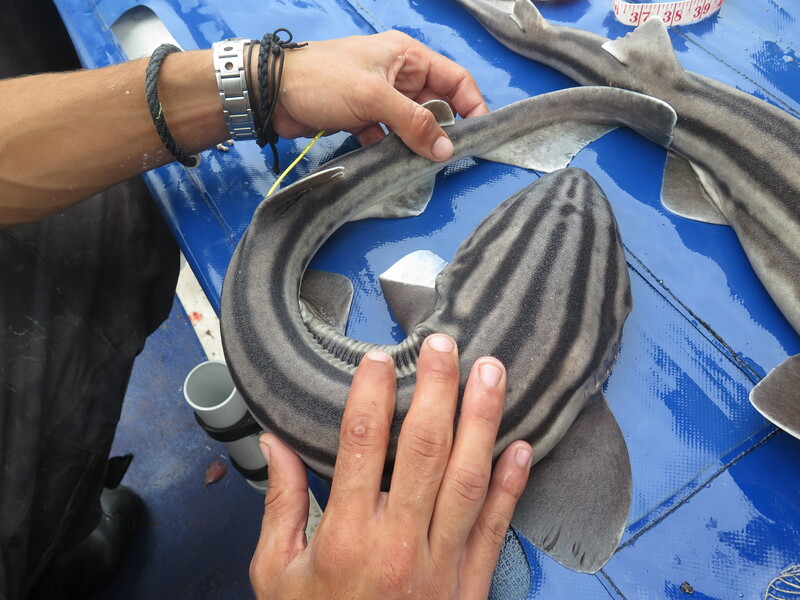 Our 6m research boat also facilitates an ‘up close and personal’ ocean experience with a host of other marine species. These include seals, dolphins, sting rays, sea birds and more! Contact Nicci on volunteer@sharkcagediving.co.za or +27 72 796 6799 to find out more or join our research & conservation programme! 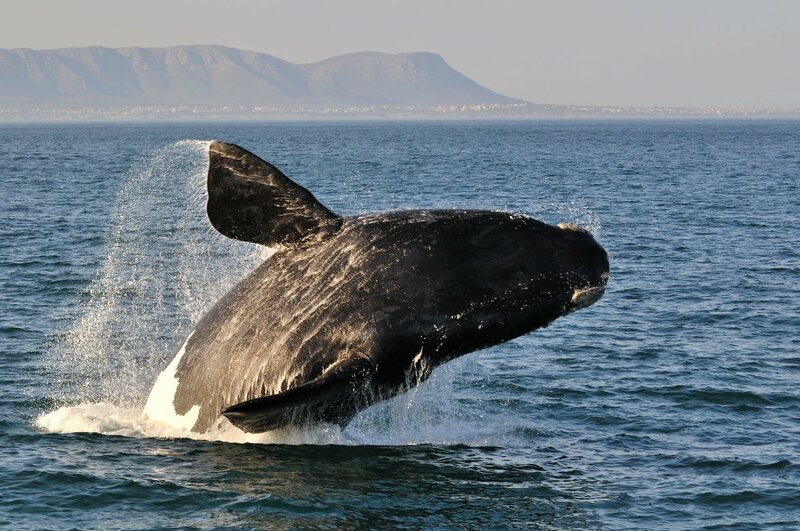 The town of Hermanus, located a 30-minute drive from Kleinbaai, is world famous for its outstanding land-based whale viewing. But De Kelders, just 10 minutes away, is a better-kept whale watching secret with fewer crowds. The high cliffs and rocky coves offer excellent protection to the southern right whales (Eubalena australis) that come to breed here. Seeing these amazing creatures from the cliffs above is an unforgettable thing to do. Did you know? Southern right whales got their name because harpooners considered them the ‘right’ whales to hunt, due to their oil-rich blubber. Insider tip – when southern rights are in the bay, head to local De Kelders coffee shop & bistro ‘Coffee on the Rocks’. Here you can enjoy magnificent whale watching accompanied by your favourite brew, delicious food, or a cheeky tipple. Penguins are among South Africa’s most comical and endearing creatures, and there are not many of them left! A 2008 census estimated that a mere 26 000 breeding pairs remain in existence. 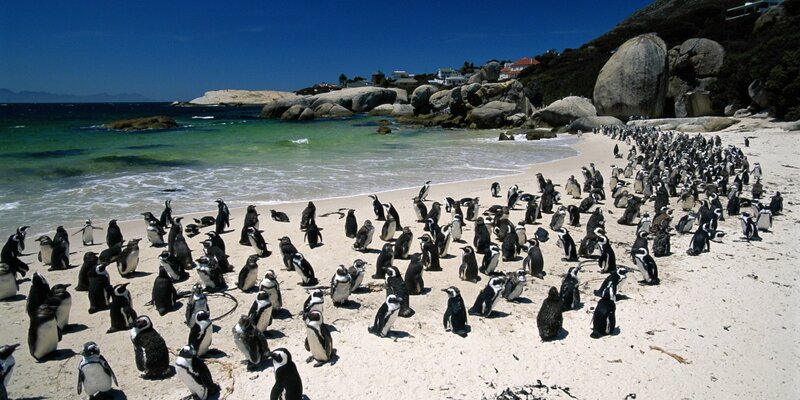 In Kleinbaai, we are fortunate to have the African Penguin & Seabird Sanctuary right on our doorstep. The sanctuary is part of the Dyer Island Conservation Trust (DICT) and functions as a rehabilitation centre for penguins and other marine birds. The sanctuary is open daily from 9am to 4pm, with feeding times at 8.30am and 3pm. Entrance is free but donations and sponsorship are welcome. We are also lucky enough to have one of the few penguin colonies on the African coast just an hour’s drive away at Stony Point Nature Reserve. Here you can see penguins in their natural habitat and, in breeding season, experience adorable baby penguins covered in their fledgling fluff. Did you know? African Jackass Penguins mate for life. 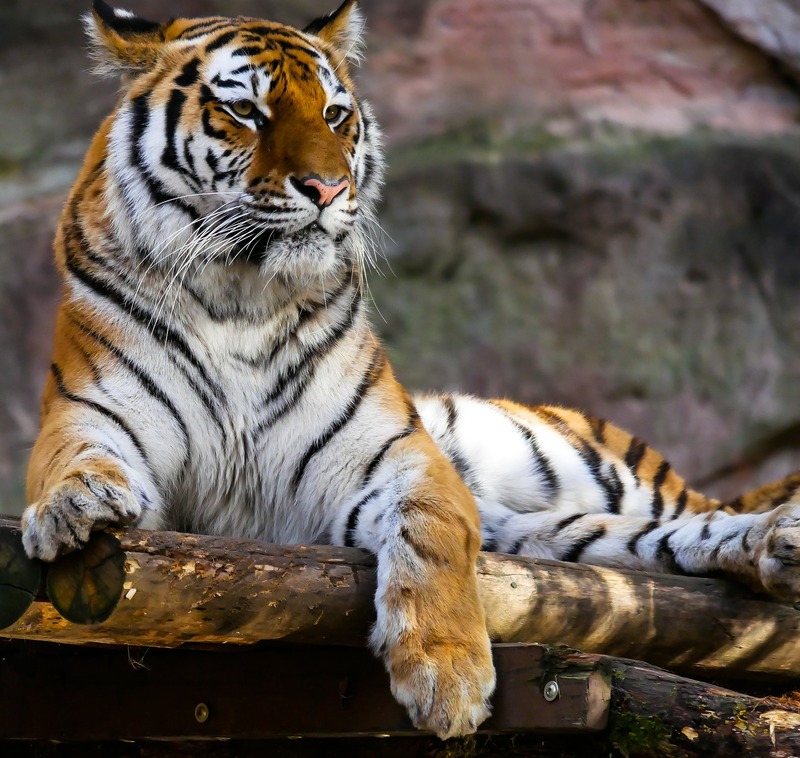 Panthera Africa is one of the few true big cat sanctuaries in South Africa. A visit here is an unforgettable local activity. There is no petting of cheetahs, cuddling cubs or walking lions on leads here. The approach is to simulate the wild environment as much as possible within realistic limits. The animals at Panthera were all raised in captivity and will never be able to be released into the wild again. However, the sanctuary provides them with a home that comes as close to a natural environment as possible within the realms of their reality. Not even staff members are allowed into the enclosures with the animals. Food is thrown over the fences and cleaning only commences once resident felines have been redirected to an alternative enclosure. There is an excellent reason for this hands-off approach. The owners founded Panthera after working for another so-called ‘sanctuary’. They later discovered it was simply a holding pen for many animals destined for nefarious futures. Several of the cats they had helped to raise had later been outsourced to private ‘petting tour’ operations or breeding mills. They were auctioned off to canned hunting facilities as soon as they became too old for their assigned duties. Panthera aims to rehabilitate cats that have been subjected to similar conditions. They also spread the message about dubious animal operations, including breeding mills and canned hunting operations. Platbos is the African continent’s southernmost indigenous forest and it is exquisite. Here you can wander amongst age-old trees and through fairytale glens. You can take in a wealth of bird life and bask in the beauty of this woodland wilderness. To experience the forest, you simply need to turn up. Just deposit the nominal walking fee into the honesty box at reception. 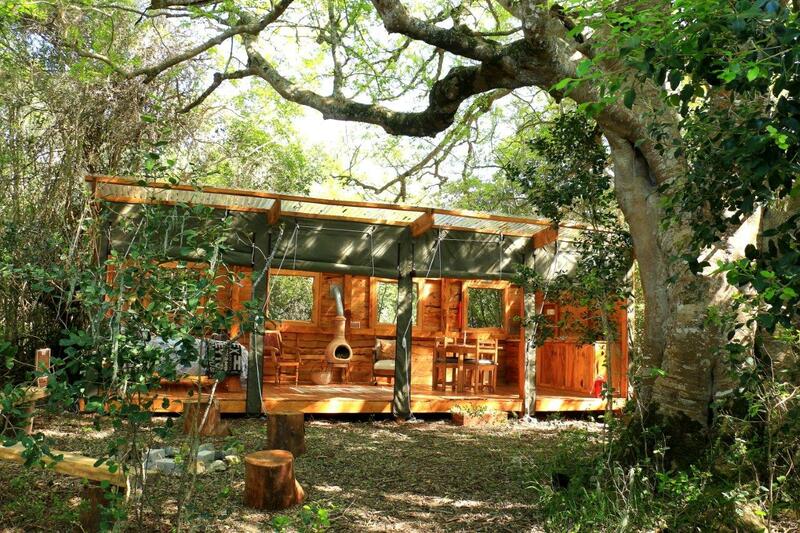 Or if you fancy spending more time here, have a look at Platbos’ eco-accommodation options. It doesn’t get much closer to nature than this. The forest’s sacred epicentre is an enormous primeval Milkwood tree, estimated to be about 1000 years old. For an even more real and raw local experience, attend the annual Platbos-GreenPop festival. By doing so, you can help to reforest the forest and revitalise the environment! The De Kelders/Gansbaai coastline is dotted with a series of caves, some of which are key archaeological sites. You can see a couple of the most interesting sites on a brief walk along the rocky coastline. Start at Klipgat Cave, located just below Coffee on the Rocks restaurant. Archaeologists have found evidence that humans lived in the cave as long ago as 65 to 85 thousand years. Then make your way on to the ‘Drip Cave’. This is arguably the most intriguing of these ancient sites but also the only one that requires a guide. It is the only fresh spring water cave on the South African coastline. Back in the day, this cavern system was part and parcel of the De Kelders Hotel (established circa 1920s). The fresh spring pools within were lauded by its guests for their healing properties. This is the only freshwater cavern system on the whole coast of South Africa. The owners eventually sold the property and an apartment block replaced it. They retained the caves as their private property, however, and today visitors can only enter under supervision. This is a good thing, as the caves constitute a magical and delicate ecosystem that fosters the creation of exquisite calcite formations. 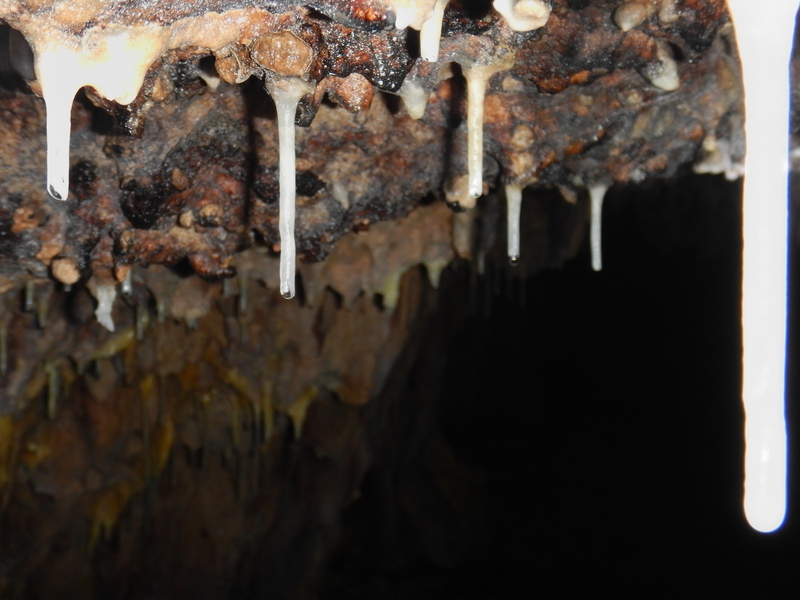 These include straws columns, cave pearls, helictites, stalactites and stalagmites. They also provide a safe habitat for two distinct bat species – the Natal long fingered and the Cape horseshoe bat. Note: check tides and make sure you wear non-slip shoes. Most of this walk takes place on the water’s edge and involves a fair amount of rock hopping and clambering. The walk requires a moderate level of fitness.